A keychain with a remote control button that can arm or disarm a home security system. They may also include a panic button, making it easier to sound the alarm from anywhere in the home. 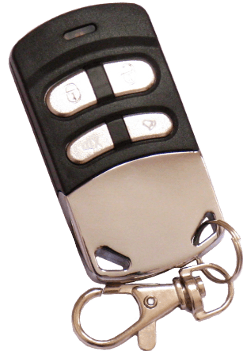 Key fobs are also used for other purposes, such as to lock and unlock car doors. Multiple key fobs can be programmed for the same home security system, which makes it possible to give them to houseguests or older children without sharing the system's security code. Key fobs usually come included in a home security system. Additional units cost about $25 to $60 each.